RBC | Colorado Parks and Wildlife is renewing its tradition of opening its parks to free entry on the day after Thanksgiving. CPW welcomes you to join us in celebrating Fresh Air Friday on Nov. 23, transforming a day traditionally spent more on material goods and leftovers into a day spent appreciating nature and having some fun outdoors. With support from our partners at Great Outdoors Colorado (GOCO), CPW invites you to connect with family and friends by getting outside and celebrating Fresh Air Friday with free admission to any of our 41 state parks. If you can’t make it to one of our state parks, CPW still encourages Coloradans to get outside to their favorite local park, open space or trail system to enjoy quality time with loved ones and create outdoor memories that last a lifetime. Starting a Fresh Air Friday tradition in Colorado is easier than ever. Aspiring adventurers can download the free COTREX trails app to choose where they’d like to hike, bike or ride. If you’d like to avoid leftovers, find a fresh catch with help from the CPW Fishing App. Families with young children can even check off activities from Generation Wild’s 100 Things to Do Before You’re 12 list right in their own backyard. Or if you simply need to move around after a large meal on Thursday, visit a local trail, park or open space near you for a family dog walk or to view some wildlife. Use our park finder to decide which state park you’ll visit on Fresh Air Friday. No matter where you go, get out and turn Black Friday into a blue skies Friday, a green trees Friday, a white snow Friday… a Fresh Air Friday! For a list of specific park activities, visit cpw.state.co.us. 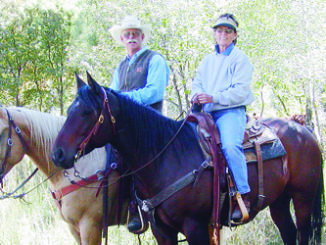 MEEKER I The Klinglesmith family of Meeker has been named the 2012 Wildlife Landowners of the Year by Colorado Parks and Wildlife. RBC I Warm weather is bringing some of Colorado’s black bears out of hibernation early and Colorado Parks and Wildlife is reminding residents to be “bear aware” to protect bears and people.